Fermenting and Brews – a healthy kind of Fizz. I’m talking about a different kind of F and B words here. I was never quite sure what to think of fermented drinks and brewed beverages. I used to think of super sour drinks that looked a bit funny with bits in, until I stumbled one day upon Milk Kefir. Being a naturally curious person, I used to pop into health food shops and have a quick nosey at their fresh counter to see if there were any healthy foods that I could try and also educate myself a bit. (I was actually looking for bits of truffle or alfalfa sprouts, the hard to get stuff). On this occasion I was a feeling a bit run down, in a hurry and grabbed a bottle of Coconut Kefir. It was the coconut that had wooed me really. Coconut can never do wrong in my books – I’m in love with all things Coco. 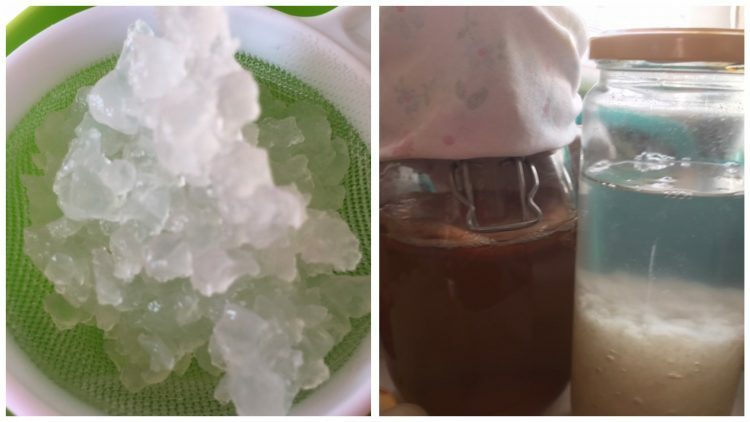 To my absolute surprise the Kefir made a huge difference to my energy levels, I noticed a boost of mental awareness and wellness and from then on started to take it regularly. I thought, wow, how can I make this stuff myself? Originally from the Northern Caucasus Mountains, Kefir is a cultured, fermented drink that tastes like a yoghurt drink. It’s made using a starter-grain which is a combination of bacteria, milk proteins and yeasts. This drink is full of many health benefits including probiotic qualities, increased immunity, improved digestion and improves allergies. Milk Kefir is brewed using milk, whilst water kefir is brewed with Water Kefir grains (like Kombucha) called a ‘SCOBY’ stands for ‘symbiotic colony of bacteria and yeasts’. I’ve been brewing Water Kefir for nine months now and know it will be something I’ll be doing for a while. The health benefits are too big to ignore. These water grains are brewed in sugar water where the bacteria metabolises the sugar and throws back into the water yeasts, food enzymes and vitamin B. I then carry out a second fermentation and flavour with different combinations of ginger, lemon, cranberries to elderflower and orange. The taste is delicious, light, crisp, like a gentle sparkling soda. As bacteria initially eats up the sugar, to make more fizz, more sugar is added then left to ferment a few days more. It’s important to ‘burp’ the bottle every couple of days as the gas ‘build up‘ could explode the bottle! I started with Milk Kefir but found Water Kefir were far easier to keep up with, so this suited my taste and lifestyle. Water Kefir is now a common word in my family vocabulary. I have now progressed to brewing Kombucha and have been experimenting with Christmas flavours such as Orange, Cranberry and Cinnamon, to Grapefruit and Cranberries. This Ferment and Brew journey is so much fun. Christmas is coming, where over-indulgence is too easy. Try brewing some of these fermented beverages to bring a healthy balance into the New Year!